Editor's Note: Tuesday's American Morning audience reacted strongly to Carol Costello's exploration of the gun control debate. Many angry gun owners expressed opinion on why they support the right to bear arms. The majority viewed ownership as a “constitutional right,” for protection and enjoyment. David: I have been raise around guns all my life. I was taught how to handle them and respect them. The people who want to put restrictions on them need to step back. If guns are a problem where you live (such as crimes and etc.... then make tougher laws and quit slapping criminals on the wrist. The Constitution says I have a right to bear arms. I also have a right to protect my self, from anybody that might break in my house and also to protect my family. Charlton Heston said it best, The day they take my guns will be the day they pry it from my cold dead fingers. Parents need to take the upper hand and learn about guns and teach their children. IF you commit a crime with a gun you should do the crime. That’s why its up to the parents to teach their kids about guns the same as you would about all the other wrong things in the world. I also support the NRA. Thank you. Jason: Personally gun control really needs to switch gears. Clearly it's in the Constitution, the right to own a gun. I recently have changed my views on this. I feel we should have the right to own a gun for protection and for sport. I personally don't hunt, but I really don't see the sport in using a AK47 and mowing down a city block in 2 seconds. chances are you're going to hit something, but whatever. What gun control should do, is actually do just that. control who can buy the guns and where they can buy them. every gun that is produced needs to be accounted for. it seems that guns were important enough to the founding fathers, to put it in the Constitution, but also they stated in the Declaration of Independence, all men are created equal. All these gun owners who are against equal rights and state the bible says that homosexuality is wrong, but no where does it say go out and buy a gun. They need to decide whether we are going to live by the bible or the documents that formed this country. they can't have it all. Angel: Owning a weapon in the us is a right given to all Americans through the constitution, there are groups and individuals that use weapons to correct problems that is wrong . A person has the right to bear arms. Fred: Regarding gun control. Firstly I am an Expert with a machine gun and a Sharpshooter with a Carbine according to the US Army. I have been taught about firearms since I was 12 years old. I have protection. No one needs an automatic weapon but the military and Federal Agencies. Pistols should only be in the hands of licensed people and bond holders of $2,000,000 or more with a State issued license. With no guns in our possession America would already have been invaded and wild animals would kill in some circumstances. Why do you think some gun owners are angry? Where do you stand on this issue? Program Note: Watch the full interview with Harrison Ford on CNN's "Your $$$$$," Saturday at 1 p.m. and Sunday at 3 p.m ET. He didn't bring a bullwhip or a fedora, but Harrison Ford brought his star power to a cause close to his heart: climate change. Actor and activist Harrison Ford speaks with Christine Romans about climate change. Ford joined the president of Guyana and executives of Starbucks, SC Johnson, Wal-Mart, Harrah's, Wrigley, Conservation International and others to launch Team Earth, a "global sustainability movement." Think of it as the companies, environmentalists and politicians together trying to outrun the massive rolling boulder that is climate change. "You have to create a movement," Ford told me, after a Team Earth press conference in Manhattan. "Like the civil rights movement, like the anti-war movement, like the youth movement of the 60's. If we can come together as an efficient mass, the issues will be addressed." Ford is particularly concerned about deforestation and notes that more than 20 percent of greenhouse gas emissions are because of destruction of the rainforests. Ford spoke on the eve of a climate change summit at the United Nations, where the presidents of the two largest greenhouse gas emitters – the U.S. and China – will address the world on the issue. In Pittsburgh later this week, leaders will negotiate a framework for addressing climate change ahead of a critical summit in Copenhagen in December. It's a lot of politics and process and, well, talking. Environmentalists like Ford are trying to seize on the momentum heading to Copenhagen. A couple's greatest joy has become, in some ways, their worst nightmare. Carolyn and Sean Savage wanted to have another child and they were having trouble, so they turned to in vitro fertilization. Then they learned the horrifying news that doctors had implanted Carolyn with another couple's embryo. Despite a history of difficult pregnancy, Carolyn and Sean made the decision to carry the child to term and then to give that baby to its biological parents. But they also wanted to tell their story as a possible warning to other couples. Carolyn and Sean spoke to Kiran Chetry on CNN’s “American Morning” Tuesday. Below is an edited transcript of the interview. Kiran Chetry: Carolyn, you're 35 weeks pregnant right now. I understand you actually went to the hospital last night. Carolyn Savage: Yeah, we just had a little false alarm last night. Being 35 weeks pregnant for me is nothing short of miraculous because I delivered my third child at 32 weeks, my second child at 30 weeks. And so it's been 15 years since I've been this pregnant. I just didn't quite know what was going on last night. So we just went in for safety purposes. And everything's fine. So hopefully we'll be able to squeeze a little more time out of this. Chetry: Everything's going fine physically, thank goodness. Emotionally, it must be such a difficult time for both of you as you're trying to figure out what to do. Take us back to the beginning. You decided you needed to get in vitro fertilization to be able to become pregnant with your fourth child. When did you realize that a terrible mistake had been made and another couple's embryo had been implanted? Sean Savage: I received a call, actually, at my desk in my office on my cell phone sharing with us that we were pregnant, but at the same time, that they had transferred another couple's embryos to Carolyn. So the news came simultaneously. And it was absolutely a shock. Chetry: Carolyn, how did you react when you heard it? Carolyn: Well, I was at home. The news went to Sean in error. They thought they were calling me and they called his cell phone by mistake. Sean came home and told me right away. It was just a very shocking moment. I couldn't even comprehend what he was saying. I know I was kind of yelling at him, asking him if he was joking. Clearly his physical demeanor indicated that there was no joke about the news he was delivering to me. 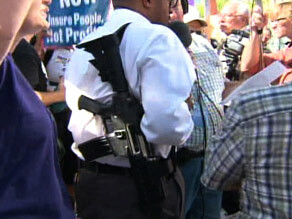 A man is shown legally carrying a rifle at a protest against President Obama in Phoenix, Arizona in August. December 15, 1791 – On that day the Second Amendment to the U.S. Constitution was ratified, sowing the seeds for an ongoing and still raging debate about the right to be free to bear arms vs. the right to be free of violence. We went to western Pennsylvania, where hunting is popular, and to Baltimore, Maryland, where it isn’t, to understand better the cultural gap that divides the two sides. Baltimore, Maryland – So far this year more than 300 people have been shot. Just last week six people died from gunfire. Baltimore is one of more than 450 small and large cities that have joined New York Mayor Michael Bloomberg in an effort to keep guns away from criminals. Baltimore also has instituted “Safe Streets,” a program that aims to reduce shootings by putting community members onto the streets at night to mediate disputes that could lead to violence. (CNN) - While some criticism targeting President Obama is racially motivated, the fight over health care isn't, former President Bill Clinton told CNN Monday. 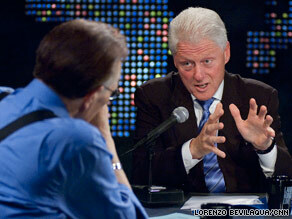 "I believe that some of the right-wing extremists which oppose President Obama are also racially prejudiced and would prefer not to have an African-American president," Clinton told CNN's Larry King in a wide-ranging interview aired Monday evening. "But I don't believe that all the people who oppose him on health care - and all the conservatives - are racists. And I believe if he were white, every single person who opposes him now, would be opposing him then." Clinton discussed a variety of issues facing the Obama administration - from health care to the war in Afghanistan - on the eve of the fifth annual meeting of the Clinton Global Initiative. Regarding race, the former president was referring to an outburst from Rep. Joe Wilson, a South Carolina Republican, who shouted, "You lie," at Obama during the president's joint address to Congress, and also former President Jimmy Carter's assessment that racism is an obstacle for the current president. "While I have devoted my life to getting rid of racism, I think this [health care] is a fight that my president and our party - this is one we need to win on the merits," Clinton said.